Camping and Mountain Bike Ride with P.U.M.P. As I’ve written about in previous posts, I’ve really been getting into mountain biking as a way to do something a bit different than road biking the long distances. Well, this past weekend was PUMP’s first summer campout. We camped out at “Paradise Campground” which is just West of a town called “Sisters” in Central Oregon. It was somewhat cushy since it had paved parking for each site, a fire pit and picnic table, running water every few sites and flushing toilets. On the rustic, it didn’t have any electricity or showers anywhere on the site. Since it was in a densely wooded area, night was pitch black. I arrived to the site at 10:30pm on Friday night after driving for almost 4 hours in a mix of some rush-hour traffic and regular traffic. I was also delayed by several stops to check the map to make sure I was heading Eastward enough miles to get to the camp. It ended up being MUCH further than I had anticipated. Really wish I could have car-pooled with someone. Being dark upon my arrival, I had a heck of a time finding a site. Luckily, I recognized someone that was up and about and asked if I could squeeze into their site for the night. I parked next to their two cars and found some trees that were properly spaced for my hammock. 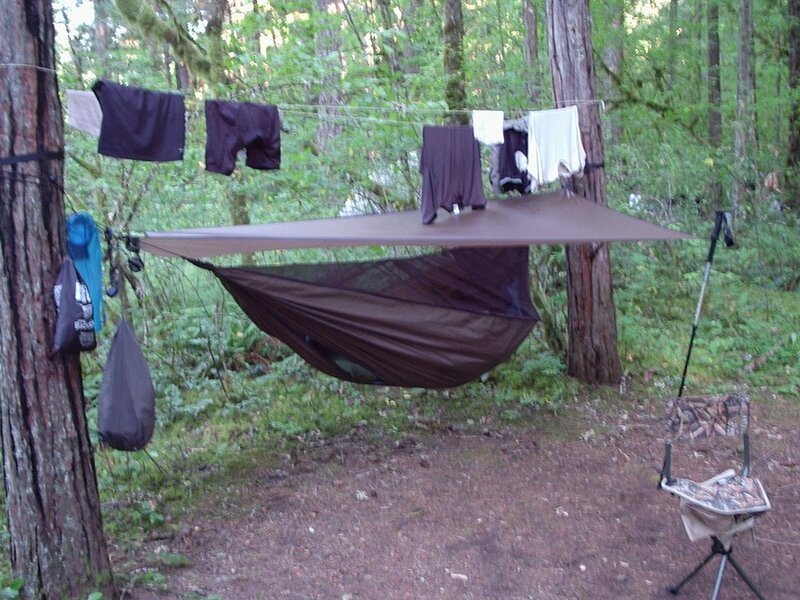 I’ve only had my new Hennessy Hammock for a few days and had only set it up once in Mt. Tabor park to see how it would go together. So, putting it up in “the wild” with just a headlamp and over some pretty rough ground made it quite interesting. After about 20 minutes of fiddling with the ropes, finding twigs to use as stakes for the rain fly, I was in bed and fast asleep. Wow, sleeping in the hammock was one of the best nights of sleep I’ve ever had at a camp site. I’m an extremely light sleeper and wake up with the slightest noise or discomfort, but I found myself quite rested the next morning. I got up around 7am and used my small Trangia stove to heat up some water to make oatmeal and hot chocolate. The little denatured alcohol stove with the titanium pots worked great! I had a nice breakfast, talked to my two temporary camp-mates about the days planned rides. I then walked around and talked to find out what the other PUMP riders were up to and decide which group I was going join for the day. One group left around 7:30am to ride the “Full Out and Back” of the trail which meant 54 miles of some really mixed technical trail. That was a bit much. I didn’t want to shuttle up to the top of the trail and only ride 27 miles back to camp, so I joined the “Easy Group” and did a “Modified Out and Back” with some beginner riders in the group. We left at 9am and made some good pace time getting up the trail that was just beautiful. It seemed well maintained, dry but not too dusty nor was it too hard-packed from all the bicycle and foot traffic. After about 8 miles, the beginners turned around and myself and a few other riders continued for another 8 miles to ride up the “lava flows”. The section of trail that we road had a high amount of old lava rock for about 2 miles or so. Rock that is very jagged, sharp, and full of technical riding. One of the fellows that I was tailing would normally go faster than me, but on the technical stuff, I really plowed through and made it to the Blue Pool without a single spill. He had to bail a few times and made it to the Blue Pool with a few scratches on his leg. Sorry Don! I’ll have to find a picture of the Blue Pool somewhere, but basically it is a small pond that has some very clear but very blue looking water. Nobody in the group seemed to know anything about it, but it was really cool looking. Too bad we were on a 30-foot cliff above water, otherwise I would have gone for a dip. After a 15 minute break, we hopped on our bikes and started working our way back to camp. About halfway up the ride, I had deflated my tires to a very low pressure so I would have excellent traction on the rocks and it REALLY paid off. Unfortunately, it also meant I was more suseptable to pinch flats. A pinch flat I got. Thankfully, I had a patch and someone to loan me a pump. I could tell that dehydration and fatigue were really starting to hit me. It had been a very warm day and although we were right next to a river for most of the ride, it was very low humidity. I rode down the last of the trail with a small group of people for the most part but completely ran out of water about 2 or 3 miles from the finish and was starting to get thirsty. Not fun. I’m not certain of the exact time, but my bike computer was showing that we were on the trial for 7 hours on the dot. That’s at least 5.5 or 6 hours of actual riding time if you exclude all the breaks and stops. I worked my way back to the campsite, eager for something cold to drink. After mixing up some Accelerade, slugging down at least 32oz of water, a serving of pre-packaged salmon, and a re-hydrated packet of spaghetti and meat sauce, I moved my hammock over to another site with Don and Kandi. They had a better spot for me to hang, it was closer to the river but no extra bugs. They were really nice and made sure I was OK and even gave me a beer. Yeah…nothing like getting the dizzying effects of dehydration, starting to feel better, then follow it up with a beer to get that same feeling. Woozy. I ended up crashing just as it was getting dark and pretty much slept through the night. I was so tired, that I didn’t really feel like being too social with the rest of the group. I just needed water and sleep. Sunday morning, I got up around 7:45am as the Sun was beating down on my hammock with the power of…well….the Sun. I ate breakfast with Don, Kandi, Jason and Kate. They were discussing going for an easy ride on a nearby trail, but I decided I was going to pack up early and head East through the mountains to explore a bit of Central Oregon. I started making my way through Three Sisters mountain range hoping to drive through the HUGE lava flows, but I was turned around and had to take a detour due to snowfall on the road. Crap. Oh well, I still stopped by some falls along the way. I then drove through a town called “Sisters”, worked my way north and made ANOTHER detour a bit East to take a quick pit-stop at Smith Rock park. Smith Rock is an AWESOME place to do some natural rock climbing. Someday I’ll do it, but until then I really need to train. I snapped a picture to show that I was there and headed back home again. Once I got into the Mt. Hood area, I noticed that I would end up driving by my work-mate’s cabin. So, I stopped and had a beer with Tim, chatted a bit about the previous day’s ride and got back on the road. I got home around 6:30pm that evening and just about hit the floor as soon as I walked in the door. WHAT AN AWESOME WEEKEND IT WAS!